This book by renowned fight instructor and founding member of the Academy of Performance Combat Andrew Ashenden takes a “safety first” approach to learning the basics of unarmed stage combat. This simple, straightforward text gives students an understanding of the subject, as well as enough information to perform some of the standard “tricks of the trade.” An introductory chapter discusses the essential rules of stage combat, like eye contact and distance, as well as useful preparations to begin combat practice. Read more...Eight subsequent chapters provide instructions for punches, blocks, kicks, hair pulling, and more, accompanied by clear photographs to demonstrate proper positions. Finally, there is a chapter on notating a fight, as well as an example provided for practice use. With its emphasis on safety, this simple yet thorough introduction to the basics of unarmed stage combat is a must for every theatre library! In this follow-up book, acclaimed fight instructor Andrew Ashenden presents the essential components of staging combat with swords. The text balances detail with clarity and will help guide students through simple steps to success with descriptions and photographs for each move. Chapters on fight stances and hand positions provide building blocks for later chapters that teach parrying, advancing and retreating, different forms of attacks, and various defenses. Safety is paramount to Ashenden, who is a founding member of the Academy of Performance Combat, so more advanced moves are accompanied by tips to minimize risk for all actors involved in the fight. The final section of the book shows how to notate stage combat blocking and also provides a sample fight to use for practice. This text is highly readable and a wonderful introduction for anyone who wants to bring swords to the stage! SPECIAL OFFER! Buy both books for $44.00! 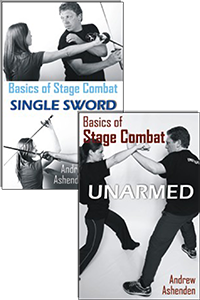 In this followup book to Basics of Stage Combat: Unarmed, acclaimed fight instructor Andrew Ashenden presents the essential components of staging combat with swords.